Your favourite marshmallow crispy treat is right here in the perfect juice. x1 Nic Shot is supplied free of charge with this product. Please check if this product is out of stock or a PRE-ORDER. If a Pre-Order then this will be shipped to you when the first batch arrives in the UK, usually the same day that we receive them in our warehouse. This will be shown next to availability. Lemon Tart e liquid. Sweet sharp lemon curd in a perfect pastry case. (Yes its better than ..
Peanut Butter Split e liquid. Ripe bananas, gooey peanut butter and caramel. Bottle si..
Tutti Fruitti e liquid The best Tutti Fruitti flavoured e liquid that we have ever tasted! You ma..
Pear Drops E Liquid This e liquid tastes exactly the same as the famous british sweets that we al..
Rhubarb and Custard E Liquid Remember those cute little rhubarb and custard two-toned hard sweets.. 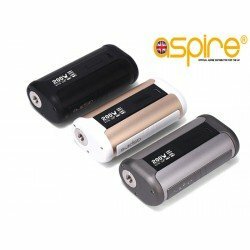 Aspire Nautilus X U-Tech Coils The brand new U-tech coils for the Nautilus X 1.5 Ohm can easil..